As the '80s come roaring back to a second ill-conceived life, Hasbro has the most to gain; they've held the licenses to both GI Joe and the Transformers since they were first popular, so they're all set. Since the Transformers never really went away, it's the Joes who are bursting back onto the scene. 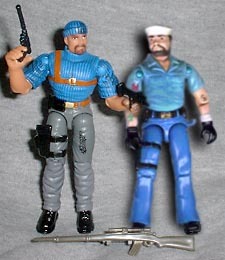 The line is officially called GI Joe vs. Cobra, and the figures are released in two-packs that reflect that; one Joe and one Cobra agent in the same blister. Running about seven dollars, each figure costs pretty much the same as they did back in the day, and that's a pretty nice find. 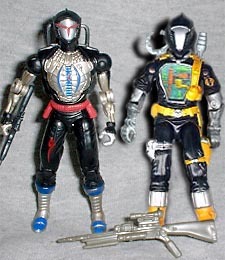 This set includes gunner's mate Shipwreck and combat robot Battle Android Trooper. Shipwreck is one of the more well-intentioned redesigns. No longer clad in his Village People sailor suit, Hector's sporting a thick cable knit turtleneck and watch cap that make him look more like a dangerous longshoreman than Little Lord Fauntleroy. On a side note, maybe it's just me, but I never thought Shipwreck looked like a "Hector Delgado." He neither looked nor sounded particularly Hispanic. Of course, maybe that's for the best; since he was an '80s character, his ethnicity would have been handled about as well as Spirit the Indian tracker or Barbecue the Irish fireman. It would've been full-on sombrero-wearin', three-bean-burrito eatin' Frito Bandito time. Hasbro continues to battle its proportional problems, and they continue to improve. This time, only Shipwreck's arms are too big; his head and chest are proportioned well. The look on his face is great, a stern glare ready to shoot at anyone who messes with him. Sadly, he doesn't have any of the tattoos that he used to - maybe his GI Joe health plan covers laser removal? Shipwreck's got a shoulder holster sculpted on, as well as a hollow holster on his leg. The fact that Hasbro wants to give its figs working holsters is nice, but none of Shipwreck's weapons fit inside - his Uzi is too big, and the silencer on his pistol is too long. The "Sound Attack" rifle, obviously, isn't even an option. I do miss Polly, Shipwreck's parrot. Back in the day, the Joes who came with a pet were always the coolest; Snake-Eyes had Timber, Spirit had Freedom, Mutt had Junkyard... the Pit was a regular menagerie! In fact, considering how specialized some of the Joes were, I wouldn't be surprised if they enlisted a guy called "Scooper" to clean up after all the beasts who were running around down there. But for some reason, Hasbro is giving the animals short shrift. Give us our animals, Hasbro! Standing 3¾" tall (duh), Shipwreck moves at the neck, shoulders, biceps, elbows, waist, hips and knees - all the classic Joe articulation. Cobra B.A.T. troops are expendable cannon-fodder for Cobra. Components are manufactured cheaply in foreign factories and assembled in secret plants by Cobra Vipers on punishment duty. Final assembly is expected to be completed by the Cobra B.A.T. troops themselves, who are handed a screwdriver and soldering gun as soon as their arms are attached. The new improved Cobra B.A.T. contains a chip pirated from a popular console video game, which allows for better target locking and accuracy. The Battle Android Trooper is a "fire and forget" weapon, in that once it is turned on and pointed at the enemy, it keeps seeking out targets until the battery dies or it runs out of ammunition. Weight considerations limited the amount of armor these robots could carry on the motor and gears section, so when hit from behind they burst into flames. The '80s B.A.T. was a nice surprise - it had a lot of detail, a great design, and a neat holographic chest that simulated its inner workings. Really, it was one of the best Joes of the entire line. So keep in mind, it's that benchmark the new B.A.T. is being compared against. First of all, the design. The proportions are much better than any of the other "Generation 2" Joes I have, but the new look just doesn't compare to the original B.A.T. The plain, haunting silver face of the original now has an angry V overlaid, and it just looks odd. The metal limbs look good, and the hologram has been replaced by actual sculpting and removable armor. The biggest problem is the paint scheme; the B.A.T. 's classic yellow highlights have been replaced with blue trim. Whether it's intentional weathering or just sloppy paint aps, the blue is fading away, and it just doesn't look good. Even the drawing on the B.A.T. 's filecard shows him in yellow, and it looks much better. Mine got sent back to the customization shop for an upgrade. The B.A.T. comes with a CR 21 assault rifle, "Sound Attack" harpoon gun, and fuel-cell backpack. He's got articulation at the neck, shoulders, elbows, waist, hips and knees. He doesn't have the bicep twists that have been a GI Joe staple since the second series of figures, though he still looks good enough that it isn't really missed. These "Sound Attack" weapons plug into certain vehicles and make appropriate sounds when a button is pushed. Personally, I think the giant plugs just look out of place, and I plan to cut them off. Say what you will about Hasbro, but at least they address their quality issues. The proportions are getting better with every series, and we're getting great versions of old figures. While the paint choices may be bad, and the weapon tabs ugly, the figures are getting visibly better every month.